That was several years ago, and I honestly think that we’ve become a little more accepting. But it is true, we do love our neighborhoods. I wonder how this businessman would have reacted had he moved here during the “Great Bumper Sticker Wars” of the 1980s. OK, I just made that term up for dramatic effect. But you do remember those days, don’t you? Now, if you’re not from around these here parts, you may not be aware that until more recent years, the idea of going across the river was somewhat repugnant to many locals. Sure, we had some great bridges, including a very nice one in the near West End. But many of my north-of-the-river neighbors acted as if one had to have both a nickel and a passport to drive across it. When I started writing this article, I asked some of my Facebook friends and acquaintances who hang out on one of my favorite pages – “You Know You’re From Richmond When…” – to tell me what they remember about the West End/Southside feud. When I first broached the subject on Facebook, I was a little worried that it might raise the ire of some of my friends. After all, today, an online discussion about something as innocent as the proper way to install a roll of toilet paper can lead to a profanity-laced tirade. But, to my delight, I found that most of the folks who frequent the page did not view the rivalry as something to be taken seriously. 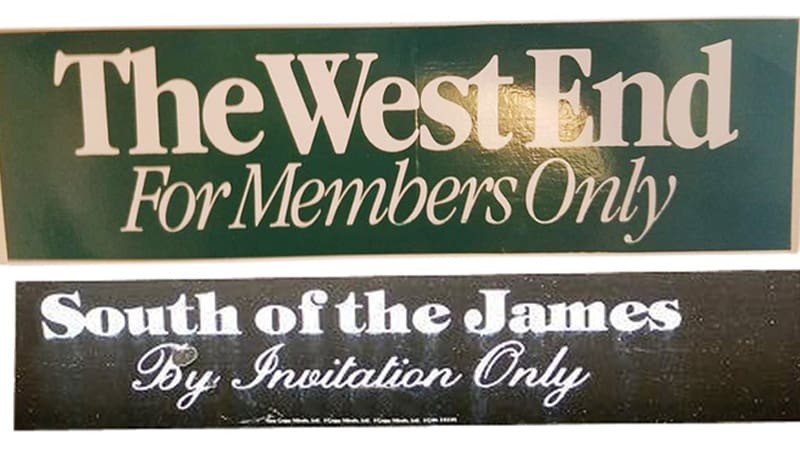 Although I grew up in what folks at the time called the West End, we never had a bumper sticker on our car. In recent years, however, even though I’ve only moved a mile down the road from my boyhood home, I have been informed on numerous occasions that I never lived in the West End at all. Generally, it’s residents of the more fashionable far West End who have insisted that I’m from Lakeside or North Side. However, thanks to a recent marketing ploy, I no longer live in either of those neighborhoods. Without having to change my address, a local real estate firm has determined that I live in Midtown. Does anyone have a clever bumper sticker for that? Linda S. offered her assessment of the feud, writing, “I have lived in both areas and I like Southside better. We are more relaxed and fun loving. West End [residents] think a bit more of themselves than they really should, but whatever, it is all good.” Now, I’m not sure if Linda put a finishing touch on the discussion or if she just fired a new volley into the fray. You decide. Steve Cook has lived in the Richmond area for most of his life, working as a writer and editor and in marketing and radio. He loves to keep abreast of the local restaurant scene and researches the subject voraciously. “I used to think I was a foodie,” he says, “but then I realized I just like to eat a lot.” He once co-hosted a local Richmond restaurant radio program with BOOMER editor Annie Tobey.